Employee concerns about layoffs have moved sharply higher according to a new survey by online jobs company Glassdoor. The percentage of those who are worried rose sharply to 22% in the second quarter, up from 17% in the first three months of the year. The firm pointed out that figure had reached its highest level since the third quarter of 2009, in the heart of the recession. Other key results of the survey are that 48% of those polled do not expect a raise in the next year, and 31% of workers "believe it is unlikely they would be able to find a job matched to their experience and compensation levels in six months if they lost theirs." Of those unemployed but looking, 36% believe it's unlikely they will be able to find a job in the next six months, the survey reported. The May employment figures show that the economy only added 58,000 non-payroll jobs that month. 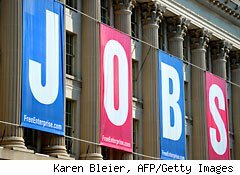 Some estimates for June are that only 100,000 more jobs added. That will not wipe out the 600,000 or more jobs lost in some months at the end of 2008. The IMF expects U.S. GDP growth will only be 2.5% in 2011, 2.75% in 2012, and doesn't forecast GDP growth in America will move above 3% until 2016. The IMF also predicts unemployment will not drop below 7% until 2014. Workers, in other words, have plenty of reason to be worried. The pessimism about job creation is an aftershock of signals sent by employers that they don't believe the recession is over. Or, if it is, national GDP growth rates are too modest for firms to risk hiring new employees. How much the economy needs to recover before employer optimism reaches a level where a large fraction of them begin to add workers again is something no one knows. In the meantime, employees are as concerned about their jobs as they have been in two years. If pessimism is the enemy of the , the recovery is hardly on track.